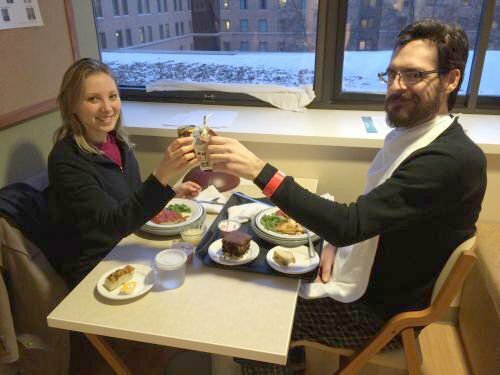 Lexi Wolfswinkle and Clint Ridley were able to enjoy a date night during his stay at Mayo Clinic while he was recovering from brain surgery. Clint Ridley is a well-known rancher, businessman and KBHB commentator and analyst. A fundraiser to help defray costs incurred during his illness will be held Saturday at Loud American in Sturgis. Lexi Wolfswinkle and Clint Ridley prepare to leave the Mayo Clinic after his recovery from brain surgery. Clint Ridley interviews U.S. Sen. John Thune, R-S.D. Clint Ridley spent Sunday driving an all-terrain vehicle around the land he loves near St. Onge. Family and friends say the change of scenery is the best medicine for Ridley who suffered a brain tumor in early February. Ridley had suffered from headaches for a while and a visit to his doctor eventually revealed a brain tumor. On Thursday, Feb. 5, during a biopsy procedure at the Mayo Clinic, he started to bleed and emergency surgery was performed to remove most of the tumor and save his life. After 19 days in ICU, Ridley continued his recovery in Rochester, and this past weekend headed home. He has continued recovery ahead, along with doctor visits, physical therapy and lots of hard work, but according to a longtime family friend, Jim Thompson, he’s up to the task. Clint Ridley is a familiar name to many in western South Dakota cattle country. The Ridley family has more than a 130 years of history in the St. Onge area. Clint followed in the family ranching tradition and is the principal at Ridley Livestock Co. and heads all the operations of the family’s agriculture business. Ridley also does the daily “Ridley Report,” an analysis of agriculture commodity markets on KBHB Radio. 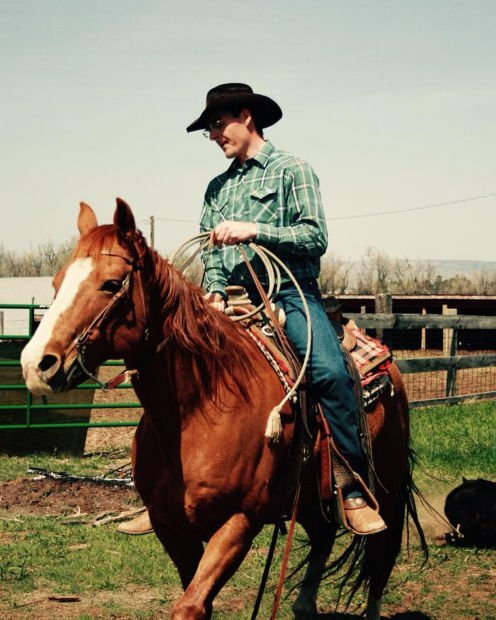 He is well-versed in the area because he also operates a livestock brokerage buying and selling cattle for a customer base from the Dakotas to Texas. KBHB General Manager, Dean Kinney said Ridley is a trusted mentor to many young livestock producers. "He's a unique person, well-respected by every person that knows him," said Kinney. "A lot of really neat people, people that know Clint, came together to do this (auction/fundraiser)." The event, dubbed Clint Ridley Day, will be Saturday, March 21, at the Loud American Roadhouse in Sturgis. Money raised will help defray expenses incurred beyond the scope of Ridley’s insurance. Events will include both a silent and live auction, and a concert and dance by Chancey Williams and the Younger Brothers. Organizers say 100 percent of gross receipts that day will go to the Friends of Clint Ridley account, established at First Interstate Bank in Sturgis. The event is being arranged by HomeSlice, a local advertising agency and the owner of KBHB and KKLS Radio and the Loud American Roadhouse in Sturgis where the event will be held. Producers are hoping for a beautiful spring day as all events will happen on that site, including in a large tent set up for the auction items. Keri Casteel is one of those helping organizing the event. The list of donated items for the auctions continues to grow, much to the amazement of Casteel. “We’ve gotten way more than we expected,” she said. Among the auction items are VIP Taylor Swift tickets, two nights stay at 4-star hotel/limo service/floor tickets at Pepsi Center in Denver for Sept. 5.; a 50-inch flat-screen TV, three loads of gravel, a quarter beef, stud fees on a quarter horse and an all-inclusive antelope hunt in Wyoming. The event begins at 11 a.m. with the silent auction. The live auction will be held beginning at 7 p.m.
Casteel says anyone who still would like to donate may do so by calling KBHB Radio at 605-347-4455, or email FriendsofClintRidley@theHomeSliceGroup.com. Items also may be dropped off at any First Interstate Bank, St. Onge Livestock, and Casteel Auction. For a complete list you can go to the http://friendsofclintridley.com/ and click on the auction tab. DaBus will be running for Clint Ridley day as well. It will make stops in Spearfish, Belle Fourche, Sturgis and St. Onge and tickets for a round trip ride and beer will be available for sale. Information will be posted on the Facebook page. Ridley’s girlfriend, Lexi Wolfswinkle, set up a CaringBridge site at http://www.caringbridge.org/visit/clintridley to keep those interested up to date on Ridley’s progress. That site will remain up as well as the Facebook page at https://www.facebook.com/friendsofclintridley?fref=nf for those who want to monitor his progress. Ridley had a rough ride while at Mayo with the initial emergency surgery, a bout with meningitis and bleeding during the initial biopsy. But he made quick progress from the initial surgery. On Feb. 5 he had surgery, and by Feb. 18 he was eating real food, on Feb. 19 he was walking the ICU and on Feb. 25 was moved to the rehab floor. Physical and occupational therapy followed, along with a few games of UNO cards. "We were told that one percent of people have complications and bleeding from a biopsy," shared Lexi. "He was one of that one percent and it may well be the very thing that saved his life. God has a plan for this man and being beat by a brain tumor was not part of it,” she shared on the Caring Bridge site. -- Deb Holland, Meade County Times-Tribune staff, contributed to this story.